Me in the black shoes with Cousin Toni Devine outside our Grandparent's bungalow 'Pendennis'. 1941/42. My Dad George with beloved pet Peter. Nina's 12th birthday party 1958. Anne Burton at the back with Alan Burton. 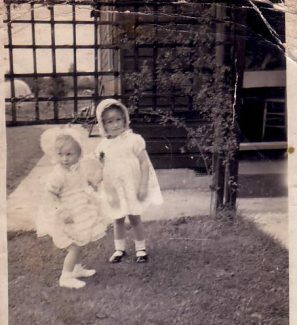 Cousin Irene Peall in white blouse next to Linda Bartley in checked dress. Front left, Betty Andrews. 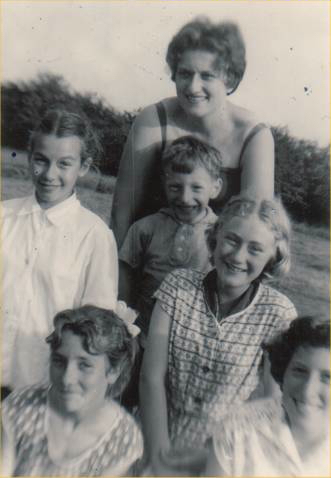 Front right, Nina Burton. I was born in the bungalow known as ‘Spion Kop’ in 1939, six months before the outbreak of WWII. Situated at the end of Alexandra Road, off the top end of King Edward Road, it was a remote and very rural area. 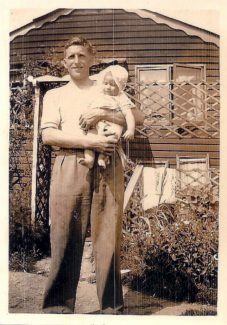 My first memories are at the age of 3, trotting round at my Dad’s heels as he went about the business of tending the extensive garden. I loved the smell of the earth as he turned over the spits and was fascinated by the earthworms and other creatures, like butterflies, grasshoppers, slow-worms and in our pond, the great crested newts, lizards and water beetles; no wonder I was interested in wildlife. 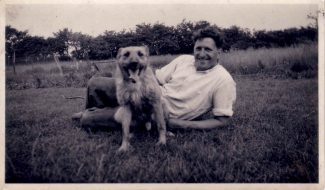 With such a big garden my Dad (George Burton) was able to make us almost self-sufficient, with fruit, vegetables, chickens, rabbits, a pig and goats. With no mains services life was very primitive. Light was via an oil lamp and heating/cooking was provided by a stove which my Mum (Jessica Burton) called a ‘Kitchener’. It burned coal and had an oven on one side and a stove top which heated the kettle, (our only source of hot water), a saucepan for vegetables and a flat iron. Washing was done and rung out by hand; OK in the summer but a nightmare in winter. Later on my Mum acquired a mangle which helped a lot. With no bathroom and the only water supply being from water tanks, which were fed by rainwater from the roof, water was a scarcity and baths in the old tin bath were a rare occurrence and we had to have strip washes with a basin on a chair. My Mum loved to listen to the wireless (radio). This was powered by a battery and an accumulator, which had to be taken to Sid and Edna Willis’ wireless shop to be recharged every week. I remember the Andrews Sisters belting out “I’ll Be With You in Apple Blossom Time” on the wireless and this encouraged me to appreciate the beautiful apple blossom with its delicate scent. What wonderful fruit we had in the autumn, several varieties of apple, pears, greengages and Victoria plums just for the taking. Air raid warnings which sent us scuttling for the air raid shelter in the garden. Listening to the rumble of a ‘doodle bug’ and hoping that it would not cut out as it might land on us. During the war our family consisted of Mum, Dad, brother Dennis and me. Later on sister Nina and brother Alan came along. Another early memory is of standing on a chair in Miss Butler’s shop and being fitted for a siren suit. I liked going to Mrs Pelham’s shop to get sweets. Lawrence’s shop opposite Markham’s Chase School (now Janet Duke) was another attraction. If we could get a penny we could have a good treat. Penny drinks, where a shot size of fruit syrup was measured out and put in a glass and then topped up with water from a carboy and you could choose fizzy or still. Chews 4 for a penny or an ice lolly which I am sure were home made as they had an unusual flavour. I remember my first Polo mint and my first taste of a banana and an ice-cream, unavailable until about 1946. When I was a little older, another treat was Saturday morning pictures at the Radion. One Saturday morning my friend Sylvie Short and I decided to spend our cinema 6d on penny drinks instead and nealy made ourselves ill with all that gas. As a teenager, I used to go to ‘socials’ (dances with music provided by records) at the Memorial Hall with my friend Wendy, or to the Basildon Country Club which seemed very glamorous. We never drank alcohol. 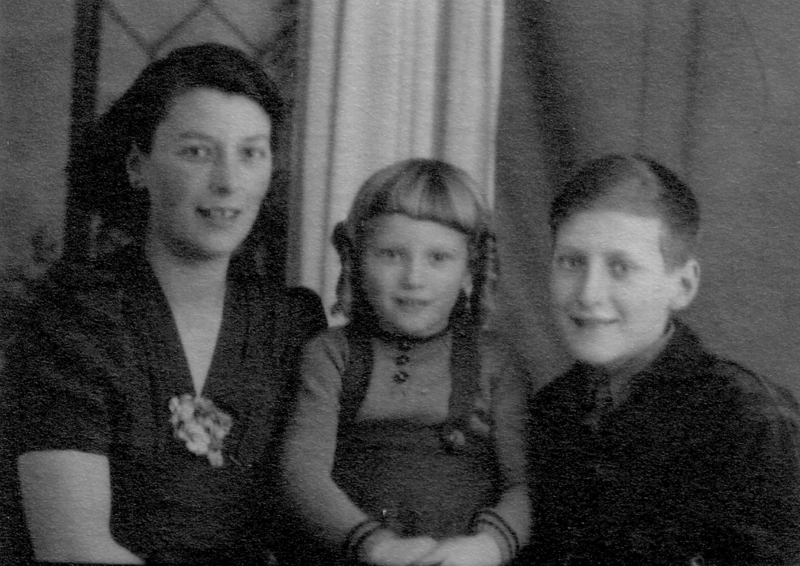 Some time after the war we had Calor gas installed, which provided us with a gas cooker, gas iron and light with gas mantles. The gas cylinders were delivered by a young man with a van which must have been difficult in winter as all the surrounding roads with the exception of Laindon High Road were unmade. Paraffin oil was also delivered via the hardware shop Hatheralls by the son of the proprietor named Jellows. Milk was delivered by a woman with a horse and cart and if she stopped for a chat the horse would decide to go home without her. I remember King Edward Road where there had been a farm, being made up and council houses being built. The road was only made up as far as Devonshire Road, so we still had to traverse a long way to get home along a footpath which was very muddy in winter. In spite of all this primitive living, it was a very happy childhood, what you never had you didn’t miss and we seemed to have so much. There was always something to do like climbing our oak tree, fishing for newts in our pond or just going for a walk around the fields. In 1953 my Dad bought an electric generator which enabled us to have a t.v. Only BBC then of course. In 1957 HURRAH, mains electricity was laid on. When my Dad bought the generator, we had a bit of a problem with the engine and so my brother Den brought a friend of his round to have a look at it - Claude Peters from Dunton Road, Laindon, who was a mechanical genius got it going again. This is how I met my future husband and we subsequently married at St Nicholas Church, Laindon on 29th July 1961. 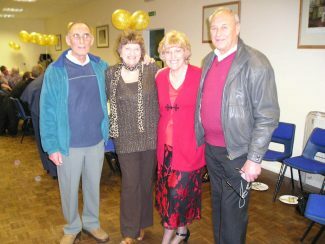 Claude worked at Rotary Hoes West Horndon (Howard Rotovators) from the age of 14 until we moved to Norfolk in 1965. 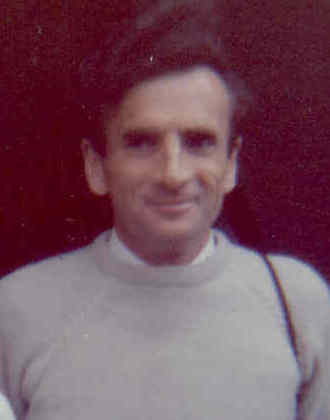 He worked at Howard Rotovators in Norfolk until his death in 1980. I remember your cousins Jimmy & Alfie Burton. I lived in Kings Road from about 1950, until 1957, when I joined the RAF, aged 18. We lived in a bungalow called ” Lyndhurst” just past the “bushes” on the unmade up part of the road. Those were the days!! Hello Michele and Anne, yes her name was or is Daisy Shipley there was also a Lilian Shipley who I think has died. Daisy was a great freind of my Aunty Marion thay use to look after me as a child always great fun to be with. Johnny Shipley a brother also a great guy died very recently, hope this helps. Yes Michelle, I do remember a girl with the surname of Shipley but can’t think of her first name, could it have been Daisy? I’ve probably got that wrong but the memory is there. So nice reading your memories. Your surname is familiar to me my mum was a Shipley not sure if you remember that name? 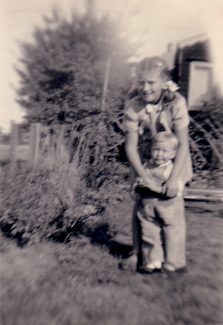 Gday Anne, so similar to our life in Peacehaven in Ronald Ave., my brother Peter was born about the same time as you in 39, we had chickens, goats, pigs [quite a few of them], rabbits, 30 fruit trees, huge veggie patch water tanks, oil lamps then calor gas lights, old black lead range [later a Rayburn]. We did get a generator in about 1954 but were out of the plots and up on Berry Lane in 1958, hard work for parents but a fantastic place for us kids,Regards from OZ. The prisoners at the prisoner of war camp used to make garden gnomes and also slippers of rope. My grandparents had a garden gnome and I had a pair of slippers.